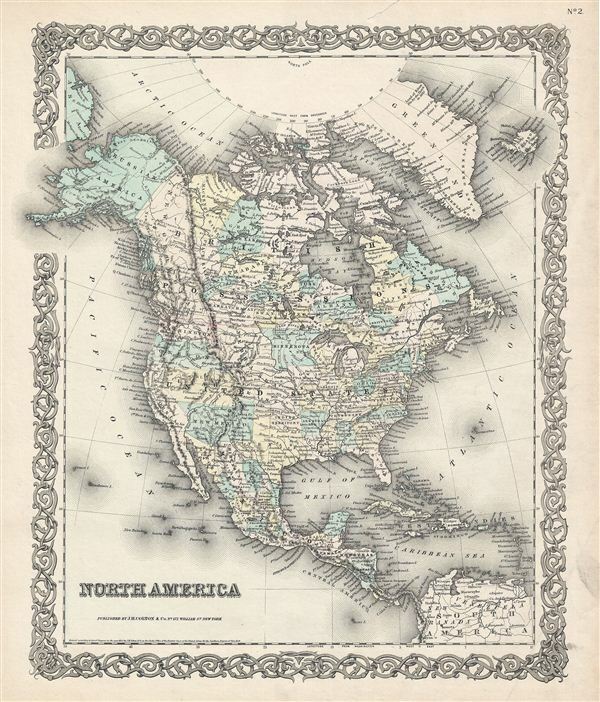 An excellent 1855 first edition example of Colton's desirable map of North America. The map covers the continent from South America to the Arctic, inclusive of the United States, Canada, Mexico, Central America and the West Indies. The United States portion of this map features an early territorial configuration of the Transmississippi. Nebraska is shown at its fullest, extending from Kansas to the Canadian border. Montana, Wyoming, Idaho, Arizona, Colorado, West Virginia, and Nevada do not yet appear on the map. Notes Russian claims to Alaska. Identifies Pikes Peak, Fremont's Peak, Mt. Rainier, Mt. St. Helens, and the Three Tetons. This map was issued at the height of the American westward expansion. Six years before this map was drawn the California gold discovery of 1849 enticed thousands to embark upon the rigorous transcontinental emigration. Meanwhile, with the rise in territorial population to the west of the Mississippi, the eastern states were becoming increasingly divided over the issues of slavery and state vs. federal sovereignty. Within five years these disputes would lead to the American Civil War. This map additionally identifies various forts, rivers, mountain passes, fords, and an assortment of other topographical details. Map is hand colored to define state and territorial boundaries. Surrounded by Colton's typical spiral motif border. Dated and copyrighted to J. H. Colton, 1855. Published from Colton's 172 William Street Office in New York City. Issued as page no. 2 in volume 1 of Colton's 1855 Atlas of the World. Rumsey 0149.011 (1856 edition). Phillips (Atlases) 816.